The first is this article for DaySpring.com about When Mother’s Day is Difficult. The second is part of my story, which I first shared on Lysa Terkeurst’s blog last year and I’m sharing again below. I hope it encourages you and those you love! The single pink line on the pregnancy test mocked me from the bathroom counter. “You’ll never be a mother,” it seemed to whisper. That scenario repeated itself for years in my life. And then my heart began to slowly, unexpectedly heal as God changed my perspective on motherhood. A turning point came as I read the third chapter of Genesis one morning. In it Eve is called “the mother of all living.” In that moment God seemed to whisper this truth to my heart: All women are mothers. Because all women bring life to the world in some way. We encourage. We feed bellies and hearts. We nurture dreams. We create beauty. We birth books. And, yes, some of us also have physical children. But that’s not the only way to bring life into this world—it’s one of many. I realized I brought life into the world through my words. I was a mother. Embracing that truth gave me new hope and helped fill the hollow space in my heart. One time when I gave the response above a friend of mine asked, “Have you heard of Saving Grace?” It turned out a transitional living home for foster girls aging out of the system was being started right there in my town. I connected with the founder, Becky Shaffer, and when I told her my dream she didn’t look at me like I was crazy. Although our lives were busy, Becky and I stayed in touch. The week of my thirty-sixth birthday she invited me to attend a banquet celebrating the accomplishments of the girls living at Saving Grace. God had impressed on my heart that my word for the next year of my life was to be love. And the night of the banquet I met my daughter: Lovelle. How old was she? Twenty, of course. Over the last year and a half we’ve become a family. She calls me “Mom” and my husband “Dad.” It turns out she’s a writer, speaker and dreamer too—which neither of us knew when we first connected. Those gifts were buried under years of abuse, surviving and even being homeless. But now they’re blooming like a sunflower. She married a wonderful guy in January so we now have a “son” too. Do I know why I went through years of infertility or why Lovelle spent so much time without a family? No … and I won’t in this life. But I do know this: God is a relentless Redeemer. He took all the hurt we experienced and transformed it into joy we never expected. God was not ignoring us. He was not overlooking our hearts. He was not holding out on us while giving everyone else what was good. Instead He was working the entire time to bring us to His very best. Mother’s Day can be painful. Perhaps like me you’re in the middle of infertility. Or you might be pursuing an adoption that’s more difficult than you foresaw. Maybe you’re single and wondering if having the family you dream of is even possible. Wherever you are today, I want to whisper this to you … God is with you and He is for you. He will not leave the true desires of your heart unfulfilled; the answers just may look different than you planned. All those single pink lines on pregnancy tests turned out to be lines in a love story. And I wouldn’t alter God’s ending now for anything. If you’d like to hear Lovelle’s version of part of our story, check out her blog. 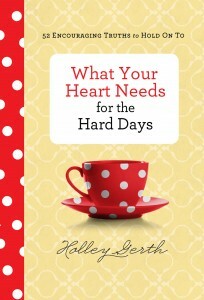 Every week I host a blog link-up called Coffee for Your Heart. You can add your post below! Hi Holley! Thank you so much for sharing your story. I love the theme of your message: I’m am not barren, I’m blessed. What an awesome reminder that so many of us needed to hear this year. And how selfless and brave of you and your husband to adopt an adult. That has got to bring blessings into your life in a way that I can only imagine. May the Lord bless you and your family abundantly! I’m inspired by your story and look forward to adopting in the future as well. Thanks for hosting the party and have a blessed week! The first thing I noticed after reading this story it that Lovelle has two lines in her name. The two pink lines you longed for all those years. God always has a plan. The more I learn of your story, the more I appreciate your honest sharing without self-pity, but with plenty of compassion for others and faith in the God who pulled you through. Honestly, Mother’s Day is a rough holiday for many because of disappointment on some level. Thanks be to God that His grace is available to patch us up and to help us find the joy that’s there. Holly, what a beautiful testimony. I recently met a young woman who was adopted at 18 and is still struggling to believe what God has done in her life. But she, too, is beginning to blossom and I look forward to seeing all that God does in her life. Thanks for letting your heartache (turned to joy) bless others and thanks for hosting. I am always reminded of your sweet story of promise when I think of birthing life in what feels like barrenness. Isaiah 54 is a consistent reminder of this to me as well. I do have children I have birthed, but yet, in a sense have at times felt barren for other reasons… but your words have been a catalyst in many ways to look beyond the physical definition and to embrace the beauty of nurturing and loving through faith. Thank you for writing these things and loving on others the way you do. Holley, thank you for sharing your story… God saw fit to bless us with two boys born of my “heart” after years of struggling with infertility that ultimately ended with a hysterectomy. Looking back, I can attest He does all things well. I wouldn’t change our story, not one bit. I linked up – thank you for the opportunity to share! I enjoy coming here each week! Thanks Holley-Mother’s Day can be difficult for so many for so many reasons-thanks for sharing your heart and your story to encourage others! Holley, Thank you for sharing this. You’re right, Mother’s Day, can be hard for so many reasons. But then there are so many love stories. Stories that come out of pain and they are beautiful. They give hope. They point to Jesus. Blessings!! Holley thanks for sharing this beautiful message of hope. I’ve been there as a Mom walking through miscarriage after miscarriage and watching our children suffer thru much of the same and worse. But we have watched God work miracle after miracle as we walked through those hard times. I remember not wanting to go to church that first Mother’s Day after losing my Mom and it was her birthday. I went and loved the service. I was ready to be in tears, but God sent a comedian to speak to us that morning. I was laughing the whole service. How precious your adoption of a 21 year old. I have no children and for years it bothered me and then, after reading the Bible, I feel that I simply was not blest that way. Also, in the Bible, it is said–somewhere–I’m not sure where, that if a woman is barren, every child she sees, is hers. Having children is a blessing for sure, however, there are other ways to be blest and the Father is generous in His blessings. Sharing your heart. That my dear friend, that is what brings people to know and love Jesus. I give thanks for you. Love, love, love you! So beautiful! Holley, thank you for your words today. Last night I attended an informational meeting about adoption and foster care. It has been something on my heart and mind for awhile now. At 38, I often wonder if I will ever get to be a mom; something I’ve desired since I was a little girl. Your words this morning touched my heart. And in a lot of ways were another God wink in my life. Happy Mother’s Day to you! Though not beautiful in the meantime, so rich in the outcome – for more than just you and your husband – so like God to be so expedient and generous in His outcomes. I will pass this on for those who struggle in the middle. My “meantime” was not getting married til 35 so my story also has pink lines turned into beauty. Thank you, Holley. Holley, Like you I had no children pass through my womb. My husband and I did adopt five, ages 5-14, from Russia. They are all now adults with their own families. It was a tough, tough road but all are doing great now. And I’ve 10 grandchildren – definitely worth the cost! Even with kids at home I felt like a constant failure and felt robbed of the true mothering experience. I love your comment: “All women are mothers. Because all women bring life to the world in some way.” After all these years, and my kids doing well, I still never considered the idea that I was a mother because I have a mothering heart. How thrilling to consider this truth. Ah, this story brings tears to my eyes every time I hear it. Thank you for loving and for letting God use you to birth hope and confidence and faith in thousands of women :). I spent a long time teaching a bible study class for women in their 40s… many who were never married and mom’s day was always hard for them. This is an excellent perspective and has inspired me greatly in how to speak to ladies who struggle with singleness or infertility. Your openness and willingness to share has power far beyond your own life. thank you! Friends, thank you for your kind words of encouragement. I hope that you each have a beautiful Mother’s Day. You are amazing! Holley, when you spoke at Baker Book House a few years ago, the one thing that you said that ministered most to my heart was how all women are mothers. I think of that truth often now and it means so much to me to see how I have “birthed” and continue to “birth” in all the ways you mentioned. Such a beautiful word from God’s heart! Thank you for sharing that… and your heart. I never tire of your adoption story – it is so pure and rich and the best example of HOPE fulfilled – times two! 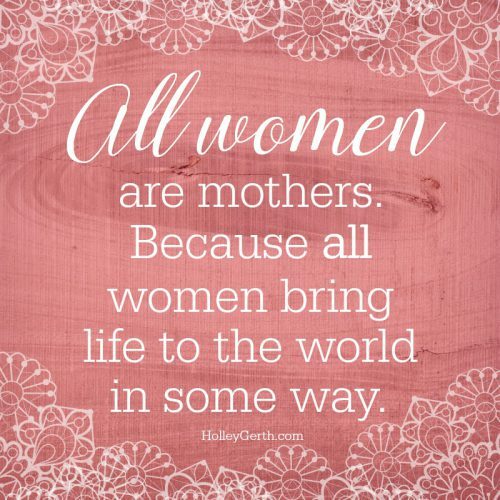 “All women are mothers. Because all women bring life to the world in some way.” I absolutely love this encouragement, Holley. Thank you! I know before you were blessed with Lovelle, I thought of you as a mother of words. 🙂 Have a wonderful Mother’s Day! I’ve read your beautiful redemption story before, Holley, how you and your husband adopted Lovelle, and the many blessings God has provided since (like the two of you sharing a passion for writing). But I cried again during this reading, heart-touched beyond words at this evidence of God’s love and clever engineering of circumstances. Our Relentless Redeemer (love that term!) does indeed work to bring us the very best! Thanks for sharing your heart, Holley. Mother’s Day can be tough for so many different in so many different ways. God’s plans are so beautiful! wow wow wow, what a blessing. Thanks for this thoughtful reminder about Mother’s Day. I agree that women carry the ability to be mothers in ways other than giving birth to children. My grandchildren are about a 7 hr. drive away so we don’t see them as often as we’d like. That doesn’t stop me from interacting with young moms and their small children when I meet them in public places, letting them know how special they are! I believe that everyone is an artist in some way but it’s not til someone points that out that people begin to believe it. In the same way, Holley, I believe you’ve reminded women that they all make beautiful contributions to our world! Thank you ! I wasn’t aware of your journey. I’m in my 50’s & never been married or had children. I always assumed I would be! I Spent a lot of time wondering what was defective about me! However, God has & continues to heal my heart, & I believe I’m turning a corner. I know it seems odd or past the season (age wise) Yet, I also have come to believe that God hasn’t forgotten me, Is In All of It & Still has a Plan! I believe I will have a husband and older children or I will mother in in some way? However, sometimes, holding onto this, is hard! This year is one of those times! It’s particularly so, because this Sat. is the anniversary of my mother going home to be with the Lord. Everything just feels kind of tender! I live in California and the Purple Jacaranda Trees are in Bloom. Purple was my mom’s favorite color & they bloomed the day after she died! They are like my own personal rainbow! I will look at them, think of your Story & remember that God Sees, Knows & Doesn’t forget Any of Us! Many Blessings to you! & Thanks so much for that reminder!